The Gunners finished a distant second to champions Leicester last season, despite sitting to of the table at the turn of the year. It means Arsene Wenger has failed to deliver the title to the club since the memorable unbeaten 2003/2004 campaign. But Arsenal themselves have plenty of money, with fans left angered by the revelation in February that there is well in excess of Â£100million in cash reserves. Despite that, Wenger did not recruit a single outfield player last summer, buying goalkeeper Petr Cech from Chelsea, and only added midfielder Mohamed Elneny from Basle during the January transfer window. This year he has brought in Switzerland midfielder Granit Xhaka for a hefty fee similar to those paid in recent summers for Mesut Ozil and Alexis Sanchez. 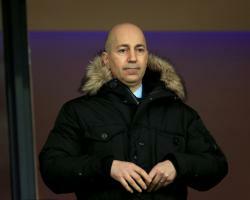 But Gazidis has warned supporters not to expect an influx of big-money buys as they watch their rivals splash the cash. "This approach, for us, gives us a very, very powerful balance because it's not just about spending money but about how you spend your money and doing it wisely," Gazidis told ESPN. But we're on the right track." Arsenal, who face Lens in their first pre-season friendly on Friday night before flying for two matches in the United States, now have the financial muscle to compete for the biggest names following years of being beaten to the punch as they continued to pay off their move to the Emirates Stadium. But Gazidis insists they will continue with their policy of believing in their young talent and do not operate to a model that would see them match the money being spent by rivals with wealthy backers. "We're making progress in what is a fiercely competitive world, against competitors that have the capability to spend far more money than we do," he said. "We're doing it by being very, very disciplined; spending money where we believe it makes a difference, but also giving young players a chance and believing in ourselves and our values." Arsenal have signed young Japan striker Takuma Asano as well as Xhaka but, given the belief in the current squad, there may be no further additions to Wenger's attacking options despite a long-term injury to Danny Welbeck and both Olivier Giroud and Sanchez set to miss the start of the season following international exertions.